Below is a plain text version of the 2017 Annual Report. You can also click here to view the visually friendly PDF. The Institute for Veterans and Military Families (IVMF) is the first interdisciplinary national institute in higher education focused on the social, economic, education, and policy issues impacting veterans and their families. Through its professional staff and experts, the IVMF delivers leading programs in career, vocational, and entrepreneurship education and training, while also conducting actionable research, policy analysis, and program evaluations. The IVMF also supports communities through collective impact efforts that enhance delivery and access to services and care. The Institute, supported by a distinguished advisory board, along with public and private partners, is committed to advancing the lives of those who have served in America’s armed forces and their families. For more information, visit ivmf.syracuse.edu. 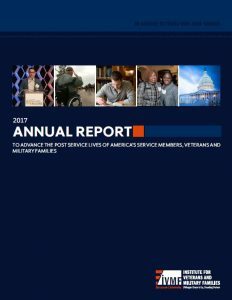 To advance the post service lives of America’s service members, veterans and military families. To be the nation’s recognized leader in creating and sustaining innovative evidence-based programs and services for America’s transitioning service members, veterans and their families; and the premier source of veteran and military family research expertise and performance measurement support for the public, private and non-profit sectors and the broader military community. Ensure IVMF’s long-term sustainability through increasing program participation and funding; improving operations; and enhancing communications, marketing and engagement. In 2017, the IVMF provided programs and services to more than 20,000+ service members, veterans, and their families with more than 90,000+ served since IVMF’s founding. Onward to opportunity in partnership with Veterans Career Transition Program. Deliver end-to-end career preparation support for the military-connected community on installations and on-line by establishing/operating programs in 18 military installation communities by June 2018 and enrolling on average 700 online learners per month. Place 30,000 transitioning service members, veterans and/or their spouses in employment or enhanced employment by 2022. Now operational in 14 installation communities covering 63 unique installations to include the first location outside the continental S.
New partnerships with Wounded Warrior Project, com, DoD’s public private partnership program and others to increase participation. Syracuse University Chancellor Kent Syverud and IVMF Founder and Executive Director Mike Haynie participated in the George W. Bush Institute’s Stand To event in Washington, DC driving the national dialogue surrounding the imperative to support student veterans on campuses around the U.S. Build, grow and support successful networks in 18 markets by 2018 and capture learnings and best practices through Communities of Practice at the local, regional and national levels. America Serves communities build coordinated networks of care and services ensuring the right person gets to the right provider in the least amount of time in the most efficient, effective way possible. Located nationally with 12 networks in 7 states supporting approximately 620+ providers. Launched Practice360, a program designed to organize networks at the local, regional and national levels to provide professional development, exchange learnings, insights and updates. Offers recurring collaborative learning activities (gatherings, trainings conferences, etc. ), professional development, and the sharing of meaningful content to stimulate our communities into higher, more sophisticated forms of service delivery. In partnership with the Small Business Administration (SBA), Boots to Business delivers a 2-day introduction to small business ownership training globally, along with a recently developed follow-on program focused on business fundamentals and market research. Increase the number of successful veteran/military-connected owned small businesses by providing best-in-class training and resources. Designed specifically for women veterans and spouses/partners, V-WISE and IGNITE are 3-phase training programs (online and in-person) with one focused on start-up, and the other on successful early-stage businesses. Designed for post-9/11 veterans, EBV is a 3-phase intensive training program offered through a consortium of 10 universities across the country to prepare veterans to start their own business. Support procurement-ready military-connected small businesses and increase opportunities for them as suppliers in the private sector; in addition, conduct research/training around the needs of veteran entrepreneurs. In 2017, the Enrollment & Advising team realigned to include a focus on post-program support enhancing services to our participants and graduates. The Enrollment team offers customer-focused services to enroll individuals in the right programs efficiently and effectively; advises each learner through to program completion by providing individualized guidance and resources; and provides resources and solutions to IVMF program alumni. To advance the practice and policy supporting America’s military-connected community through rigorous applied and translational research, measurement and evaluation, and objective insights that empower action. The Institute’s growth resulted in a 33% increase in new staff in 2017. The National Veterans Resource Center (NVRC) at Syracuse University was conceived as a class-leading, national exemplar of academic, government, and community collaboration. The NVRC will leverage a public-private sector partnership model to nurture academic research, actionable programming, and collaborative thought leadership positioned to impact veterans and their families on the campus of Syracuse University, in New York State, and in communities across the U.S. Accordingly, the NVRC will create the conditions necessary to build upon and solidify this region’s ongoing effort to position Central New York as the nation’s hub for research and programming connected to the veteran and military sectors — helping make the region and New York State the best place in the nation for veterans. The NVRC will also result in hundreds of millions of dollars in economic activity, the creation of hundreds of high paying jobs and seed the conditions for future growth and new opportunity. Working with Programs and Services, Research and Evaluation, IVMF leadership and other staff, the Development team focuses on cultivating public and private partnerships to raise sufficient resources supporting the programs, services and operations of the IVMF. Center for Spiritual Living Midtown, Inc.
CSM Gary I. Ginsburg USA, Ret. Col. Casper P. Jones III, USA Ret. Mr. John F. Murphy, Jr.
Col. Thomas D. Shearer & Lt. Col. Pamela A.
Mr. Joseph V. Shields, Jr.
Mr. Allan E. Thompson, Jr. The Institute for Veterans and Military Families is the recipient of many gifts each year that honor or memorialize our friends, patrons, and loved ones. We are grateful to the following individuals who made such gifts between January 1, 2017 and December 31, 2017. Mr. David Carlyon in Honor of Mr. Martin J.